Microsoft has released Azure Data Studio, an open-source, cross-platform tool useful for database development and operations of SQL server. It was earlier named as SQL Operations Studio during it’s preview stage. This is a light weight tool and empowers DevOps practice for SQL Server Development and Operations. This client tool is designed in such a way that the developers who do not have extensive knowledge in database administration can easily manage the databases and do the routine maintenance with least learning-curve. However, Azure Data Studio is NOT a replacement for SQL Server Management Studio. SSMS is still the go to tool for any SQL Server DBA as it has lot of advanced features needed for a professional DBA. Instead, this tool is aimed at the non professional DBAs, mostly the programmers who are involved in the development as well as taking care of the routine maintenance of databases. Now, we will see the various features of Azure Data Studio in this article. Cross-platform tool that can be used in Windows, Linux and Mac. There is no installation involved. You just need to download and copy the files to deploy the tool. It has an advanced query editor which helps in diagnosing errors. You also has the option to format the query scripts. The tool-tips, auto suggestions and peek definition options will help you in development. The query results window has options to export the result set to Excel sheet or CSV file or JSON. Azure Data Studio is integrated with Git repository for version control and manage the SQL script files. Using smart Transact-SQL code snippets, you can generate database, tables, stored procedures and other objects to create copies of the database for testing in a short time. The integrated terminal window provided in SQL Ops Studio will allow you to use your favorite command line tools like PoserShell, bcp, bash, sqlcmd or ssh. There are options to group the servers and databases and organize the connection details as you prefer. This grouping option will help you to monitor multiple servers and databases from a single dashboard. The database and server management dashboard has options to add customize-able monitoring widgets to monitor the database. They can even help you to troubleshoot the performance bottlenecks. You can easily backup the databases, view the backup status, generate the backup script, restore the databases and view the restore task status from the dashboard itself. SQL Server: 2008 and above. Azure SQL Data Warehouse (DW). Windows: From Windows 7 (SP1) 64 bit onward. Windows Server: From 2008 R2 (64-bit) onward. macOS: 10.12 Sierra and higher. Linux: Red Hat Enterprise Linux 7.3 and higher, SUSE Linux Enterprise Server v12 SP2 and higher, Ubuntu 16.04 and higher. You can download this tool from GitHub (https://github.com/Microsoft/azuredatastudio). There are downloads available for Windows, macOS and Linux flavors. Azure Data Studio is good for non-professional DBAs who are doing basic database maintenance tasks. It reduces the learning curve. This is a light weight tool and occupies much space in your computer. It just has the features needed to fit in the DevOps concept. Most importantly, unlike SSMS, It is multi-platform and available for macOS and Linux along with Windows. As it’s open-source, you can fork the source code and do customizations in case if needed. Moreover, the integrated git code repository allows you to version control the T-SQL script files. It is not as robust as SQL Server Management Studio. It does not have the advanced tools which are available in SSMS. So, Azure Data Studio may not be helpful for a professional DBA. 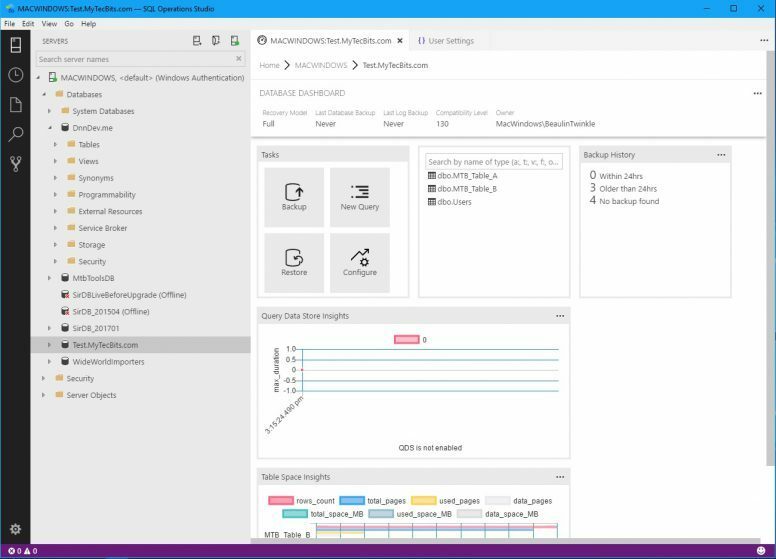 To sum up, Azure Data Studio is a great light weight client tool for programmers and web developers to execute SQL queries and verify data time to time when need arises. I have installed it on my macOS workstation to connect my remote web server databases for minor database tasks. Tutorial for Azure Data Studio is available at Microsoft Docs. ← Where is SQL Server Configuration Manager?